What is the difference between a UA Little Rock Online student and a Main Campus student? A UA Little Rock Online student is declared in one of the approved, fully online degree or certificate programs that make up UA Little Rock Online. A reduced, standard rate of tuition is associated with these programs. UA Little Rock Main Campus (or “Little Rock Campus”) students may take any combination of face-to-face, online, hybrid, or web-cast courses to complete their degree. Main Campus students are assessed the regular tuition and fees associated with their college and the academic year. Both Online and Main Campus students have full access to the university’s academic resources. Learn more about the differences by visiting “UA Little Rock Online Explained” on the UA Little Rock eLearning website. Am I ready for online courses? What are the basic requirements for online courses? Read more about the system requirements at our Blackboard Student Support website. Note: Students taking online courses should have regular, reliable access to and control of a computer as your assignment dates may vary. Some courses may also require additional equipment or software. Check with your instructors and course syllabi to determine specific requirements for your online courses. Online courses are accessed through Blackboard, UA Little Rock’s learning management system. When you log into Blackboard, you’ll see links to your current courses, as well as announcements and other helpful resources. Each course has its own homepage, where you’ll be able to manage assignments, watch video lectures, communicate with your instructor, participate in discussions with your classmates and use other digital tools for an engaging learning experience. Note: Students will not have access to their Blackboard courses until the first day of the term. 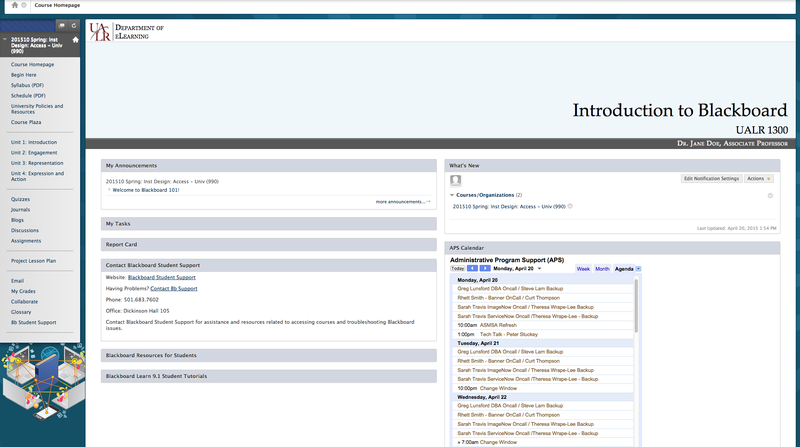 This is an example of a Blackboard course homepage. How can I keep track of everything? The “Quick Links” menu at the top of any UA Little Rock webpage gives you direct access to three primary resources you need to be a successful student: your Blackboard, BOSS, and UA Little Rock Gmail accounts. All students are encouraged to check these accounts daily and utilize the tools available within each program. Students are also encouraged to frequently check the latest Academic Calendar and copy important dates into their personal calendars. Blackboard offers several tools that help students stay on track and organized. The calendar tool keeps all your assignments and tasks in order, and you can easily import it into your personal calendar applications. You can also check your current grades, announcements from your instructors and online resources through the Ottenheimer Library. Want more Blackboard tips? Visit the Blackboard student support site. BOSS is the one-stop, online system for access to your university record and where most students conduct business from accepting financial aid to registering for classes, paying their bill, and checking grades. Have questions about BOSS? Contact IT Services at 501.916.5073 or itservices-help@ualr.edu. Gmail and other Google Apps are available to every UA Little Rock student. Whether you need to communicate with your instructors, schedule important dates, review or share your notes, or collaborate on group projects with your classmates, it can all be done through your UA Little Rock Gmail account. Need help with your email? Visit the IT Services email support page. Tip: You can bookmark the “Quick Links” page to easily reference important UA Little Rock resources. Online courses are often based on a weekly schedule rather than a daily one, but the requirements of some instructors will vary. A good rule is to devote at least 2-3 hours of study per credit hour each week. For example, if you’re taking a course that’s worth 3 credit hours, you should spend 6-9 hours of study time each week on the material. Note: Because accelerated courses are condensed to half a semester, they require twice as much study time per week as a semester-length course. Online students enrolled in accelerated programs should be prepared to spend a minimum of six hours a week on coursework for each credit hour. For example, a student taking a three-credit hour course should plan to spend approximately 15-18 hours per week on that particular course. We highly recommend that students take no more than two accelerated courses per term. Students declared in an approved, online degree or certificate program through UA Little Rock Online receive standard rates — $280 per credit hour for undergraduate programs and $383 per credit hour for graduate programs – that include tuition and fewer fees. Students who are not declared in a UA Little Rock Online program are assessed the same tuition and fees for online courses as on-campus courses, plus a distance education technology fee. Discounts are also available for military students. Visit our “What it Costs” page for more details. What will appear on my diploma? UA Little Rock Online is the University of Arkansas at Little Rock’s brand of fully online degrees and certificate programs. 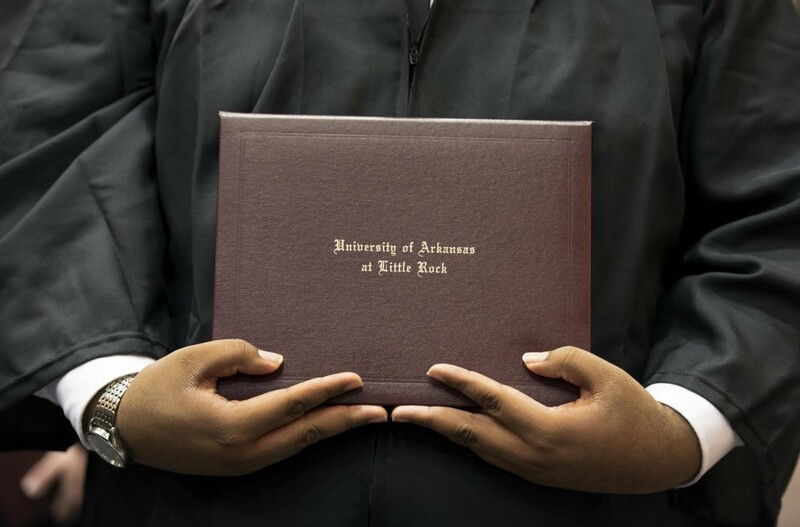 The diploma will be issued by the University of Arkansas at Little Rock, and the program listed will not contain the word “online” unless it is part of the program itself (i.e. “Online Writing Instruction”). What online resources are available to me? Blackboard student support offers a variety of resources for users including tutorials, links to helpful resources, and answers to students’ frequently asked questions. Students may contact Blackboard support specialists by phone or through a simple online form, and are encouraged to bookmark the website for easy access to support resources. The IT Services Assistance Center helps students with issues related to accessing the network on campus, logging into UA Little Rock systems (Blackboard, myUALR) or UA Little Rock email. Students who take courses online have access to the Ottenheimer Library. Through the library’s website or Blackboard, students can take advantage of different research databases, scholarly journals, e-books and other research materials. Chat, email or speak directly with a librarian through the “Ask a Librarian” feature. Online students who need help with their writing have a valuable resource at their fingertips through The OWL, UA Little Rock’s Online Writing Lab. OWL assistants provide quality feedback and problem-solving strategies for students’ writing assignments. The Disability Resource Center collaborates with students, faculty, staff, and community members to create usable, equitable, inclusive, and sustainable learning environments. Students who are living with a disability and require support for their academic success may contact the center for solutions. UA Little Rock is a military friendly school, both on campus and online. Military and eligible dependents may find a multitude of academic support resources through UA Little Rock’s Military Student Success Center. Students can buy or rent textbooks (new, used, or digital), as well as planners and other supplies online through the UA Little Rock Bookstore. While you’re there, check out the university apparel and accessories to show your school spirit!